Today: In a matter of days, give the dry grains, beans, and seeds languishing in your pantry a fresh start—and give yourself a seriously nutritious, delicious, and cheap ingredient to play with. Sprouts at the grocery store are, what, 5 dollars a pack? 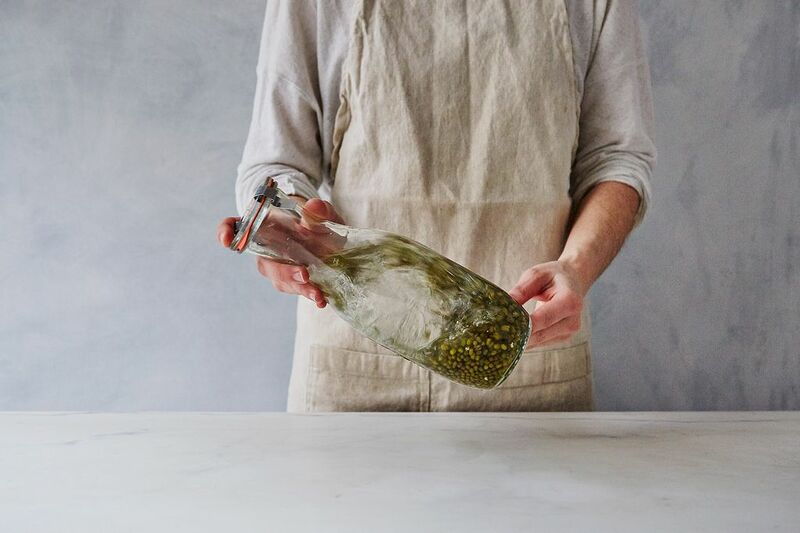 When you realize that making your own requires only a jar, bowl, cheesecloth, rubberband or twine, a few days, and a handful of grains, beans, or seeds, you will never buy sprouts again. Oh, have you never bought sprouts before? That's okay—just go straight to making your own. They will be the brightest thing to come out of your pantry. 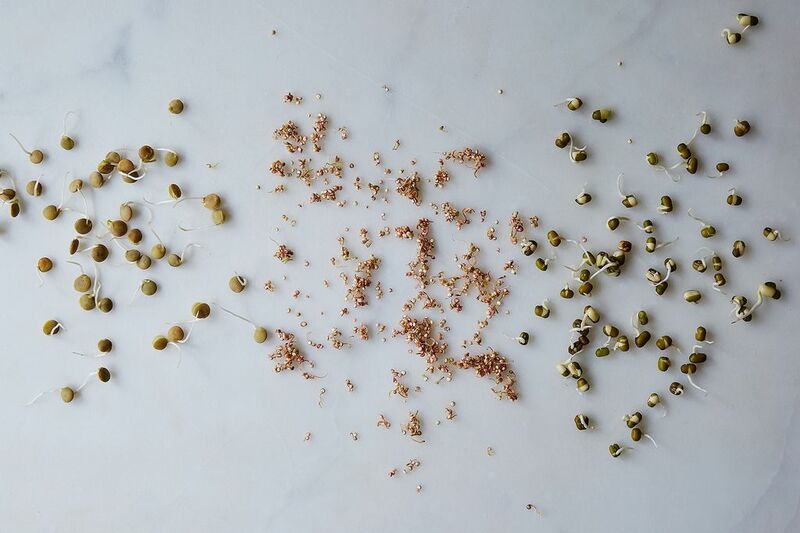 Sprouting turns a really hard, dry ingredient into something lively that pops in your mouth, that's subtly sweet, and that packs a serious nutrient boost. Think of sprouting like growing your own tomatoes or cucumbers, only without the large chance of failure, the wait time, and the need for outdoor space, sunshine, and special materials that can't be found in your kitchen. But what can you sprout? How long does this operation take? It depends on what you’re sprouting and the temperature in your house, but most take around 3 days. Smaller ingredients, like sesame and sunflower seeds and quinoa, will take just a day after soaking. Heartier seeds, like alfalfa and mustard seeds, can take up to 5 days. Before you dread the idea of tending to your grains day after day like a wintertime herb garden, keep in mind that you only need to pay attention to this affair for about 5 minutes in the morning and then again at night; it needn't consume your weekend or even your 8 AM hour—and if you forget to rinse your grains once or twice, they will not rebel. In a jar for which you have a lid, combine one type of whole grain, seed, or bean and filtered water in a 1:3 ratio. If you want enough sprouts for a few salads and sandwiches (fresh sprouts don't keep for that long anyway), 1/2 cup of dry ingredient in 1 1/2 cups of water is a good place to start. 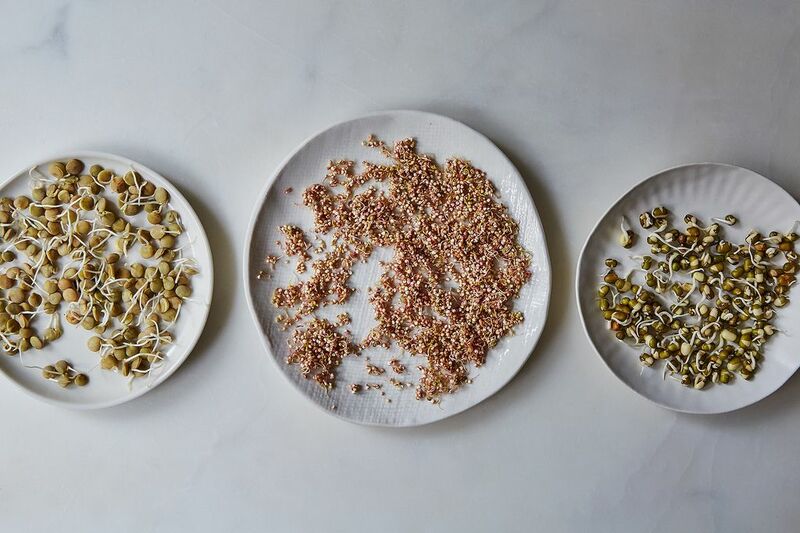 If you’re sprouting seeds, you’ll only need a few tablespoons: They’re small in dried form, but expand quite a bit when sprouted, and you don't want to end up with a ton of sprouts—or maybe you do, in which case, ignore me. 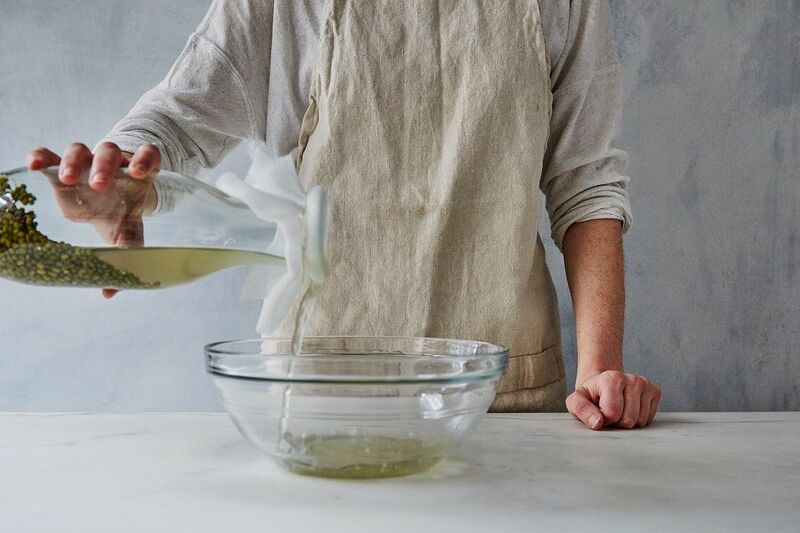 Cover the top of the jar with two layers of cheesecloth secured with twine or a rubber band, and let the mixture soak overnight at room temperature. 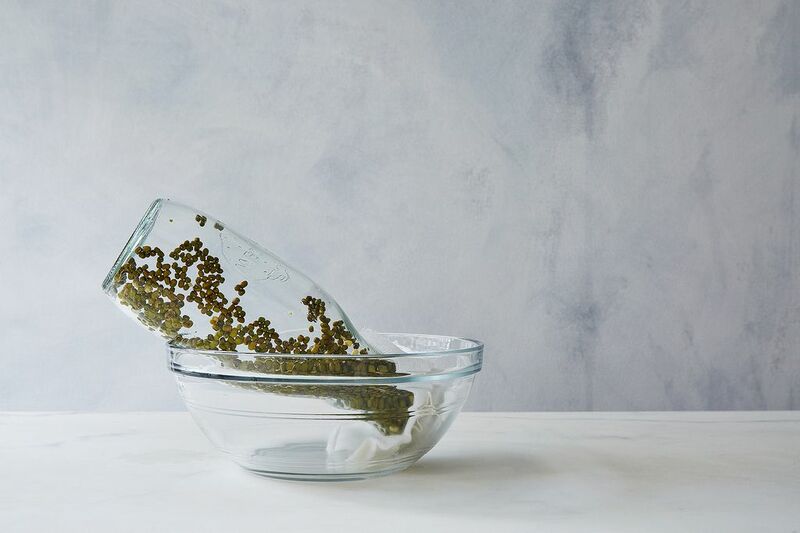 Upend the jar into the sink or a bowl to drain the your grains, beans, or seeds really well. Give the jar a few shakes to make sure all the water is out (too much moisture means mold, the number one problem with sprouting). Place the jar at an angle, with the opening pointing down, in a bowl. Let the water continue to drain at room temperature out of direct sunlight overnight. Sometimes, if you’re lucky, you may visit your jar the next morning and your grains, seeds, or beans will already be sprouts. Most times, though, you’ll have to be a bit more patient and rinse and drain them a few more times. Every morning and night, visit your soon-to-be-sprouts. Take off the cheesecloth, cover whatever you're sprouting with water, seal the jar with its lid, and give the mixture a good shake. 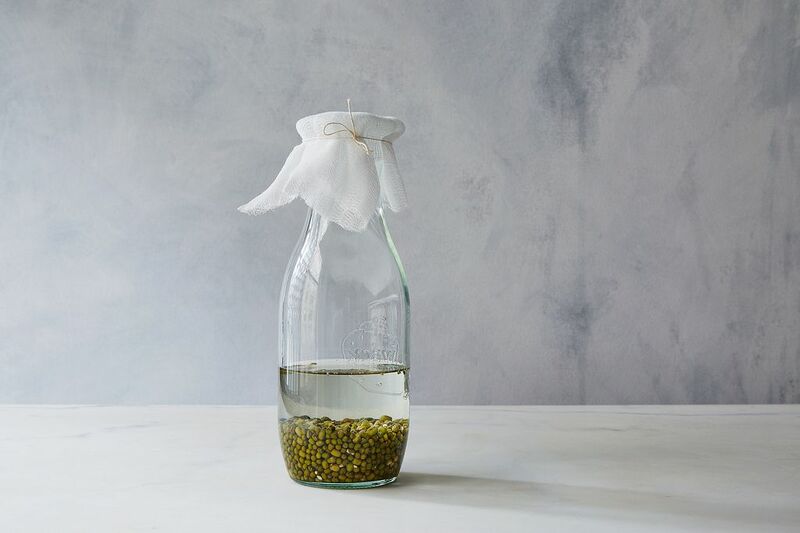 Swap the lid for cheesecloth secured with twine or a rubber band, then drain the water, shake out any excess water, and prop the jar back in its bowl. Repeat until the day you visit your jar and the grains, beans, or seeds' tails are as long as their bodies. They're sprouts now! Once you have sprouts, don’t rinse them again (let’s avoid molding at all costs, okay?). Store them in the fridge in a sealed jar or other storage container, where they’ll keep for a few days. If they start smelling really strong, they’re past their prime. 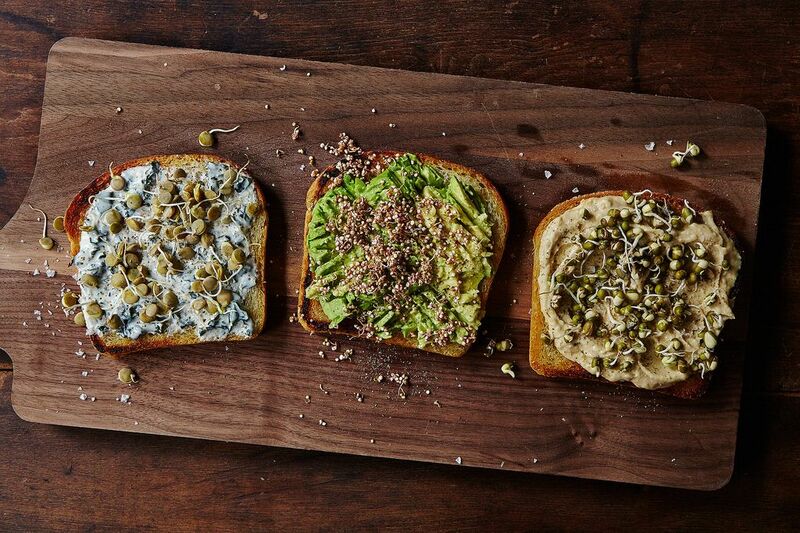 Besides chucking them into your mouth for a crunchy, cooling, on-the-go snack, sprouts can top toast or salads—even turn into salads—fill sandwiches or burgers, or get blended into soup. Replace garbanzo beans in hummus for the sprouted variety (or any sort of sprout, for that matter); you'll end up with a brighter, crisper flavor. This post originally ran in April 2015. Thank you for this Ali, I'm inspired to go back to my hippie days and ways. Echo Horizon remembers you, fondly ! Sorry if this is a silly question... For the garbanzo beans, do we need to cook them after they have sprouted? I have sprouted chickpeas before but cooked them just to be on the safe side. No, you don't have to cook them, you can eat them raw. Any raw dried seeds or beans that are food safe should be fine. I usually just sprout some from those I've bought to cook. You don't want to use seeds meant for planting because they are often treated or coated in some way to promote germination. Also, they are far more expensive than sees/beans/grains sold for eating. The only time I've bought seeds meant especially for sprouting was when I wanted radish/onion/clover sprouts and they really don't sell those seeds at the market. ;) Great reminder for those of us who've forgotten to sprout for a decade or two. Thanks! You can order seeds for sprouting off the internet. hi, my question is do we have to cook after sprouting or they are ready to eat like that? One question for you: does the water you throw away after the initial soak have any nutritional value? A great article by the way! I see pumpkin seeds aren't listed...but can I sprout those before dehydrating/roasting them? Basic question, maybe I missed it above. Do the beans need to be cooked at all or are you using dried beans? I'm using Mung Beans. I would also recommend a wide-mouth jar rather than the one shown - it will be MUCH easier to remove the expanded volume from the jar. What a fabulous guide to sprouting! I'm a bit shocked realizing that I haven't sprouted anything since my childhood... Need to get into it again. The sooner the better! A huge thank you for the inspiration, Ali!